An embedded applet is loading below, may take a few seconds. When the applet loads (goes black) you can start clicking in it to paint. Full instructions are underneath the app. = - toggle wrap-around mode. When brushes wrap around you can create interesting repeatable tiles, great for textile patterns etc. [ and ] - rotate (left / right) the starting angle of the brushes. [space] - clear screen to current colour. Used for changing background colour. My main interest with this type of program is as follows. If you imagine a spectrum with at one end, traditional paint programs like Photoshop (a passive tool which the artist has to animate to do their work), and at the other, completely algorithmic or process based works (where the artist is the programmer who defines the algorithm or simulation and sets the computer in motion for a passive viewer), then I'm looking for a sweet-spot, somewhere between these poles, where the user / viewer is highly and dynamically engaged with the computer / program in a process of "co-creation". The user is effectively managing a swarm of agents who have their own behaviours and who interact with each other and the work-in-progress. c) get closer to this sweet-spot, then I'll add them. I like to take works out of the computer and into the world. Flower Brush is an obvious candidate to make textile patterns, especially with the wrap-around mode so I made a couple of quick designs and uploaded them to SpoonFlower, a service providing on-demand printing on textiles. All the examples in the picture use wrap around mode. 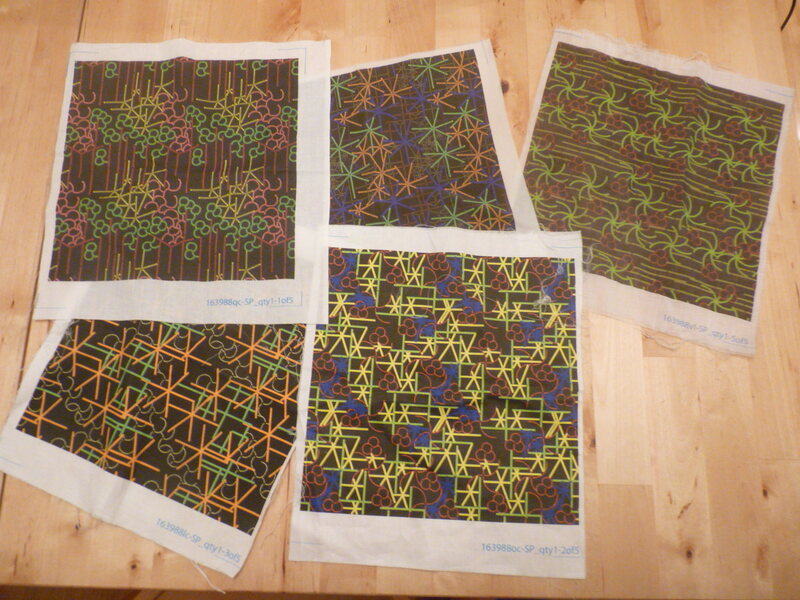 You can see these patterns and even buy material with the patterns on the SpoonFlower site.